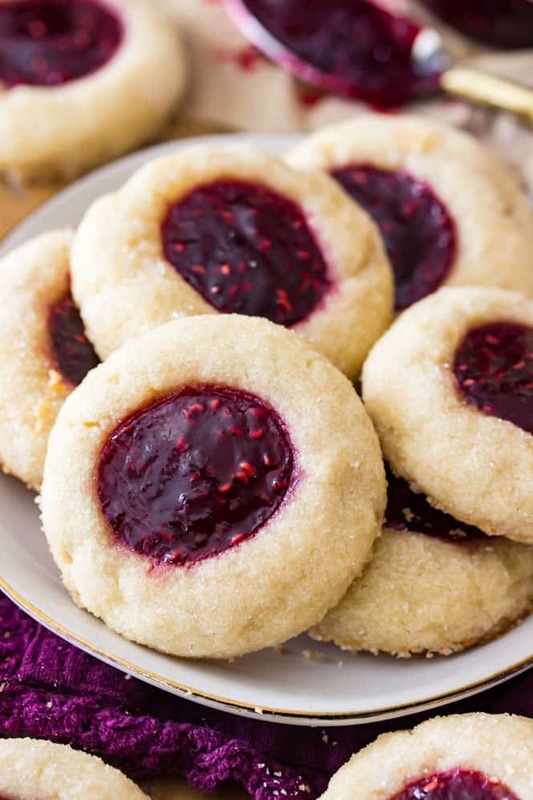 These classic thumbprint cookies are made with a simple sugar cookie dough, rolled in sparkling sugar, and then indented and filled with your choice of jam! 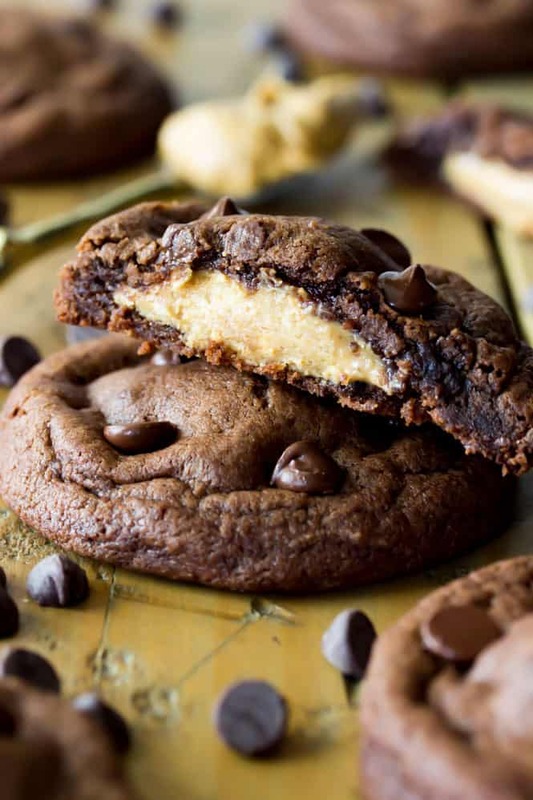 These are an all-time favorite cookie recipe, and the filling options are absolutely endless! We had our first snow here this past weekend! It was a light snow that’s pretty much all melted away by now, but Saturday (which also happened to be my birthday) was beautiful. It was so cozy in my kitchen with the glow from the Christmas tree and Christmas music playing, and to top everything off I had a batch of these thumbprint cookies baking in the oven, which I shared that evening when my family came over. Even though the birthday cake that Zach made me was the dessert star of the show, I also had these thumbprint cookies out for a bite-sized treat option (because you can’t have too many desserts), and everyone loved them. Even Andi liked them, though she only ate the edges of the cookies and wouldn’t eat the jam filling because of seeds (I’d think that was ridiculous if I wasn’t exactly the same way at her age). 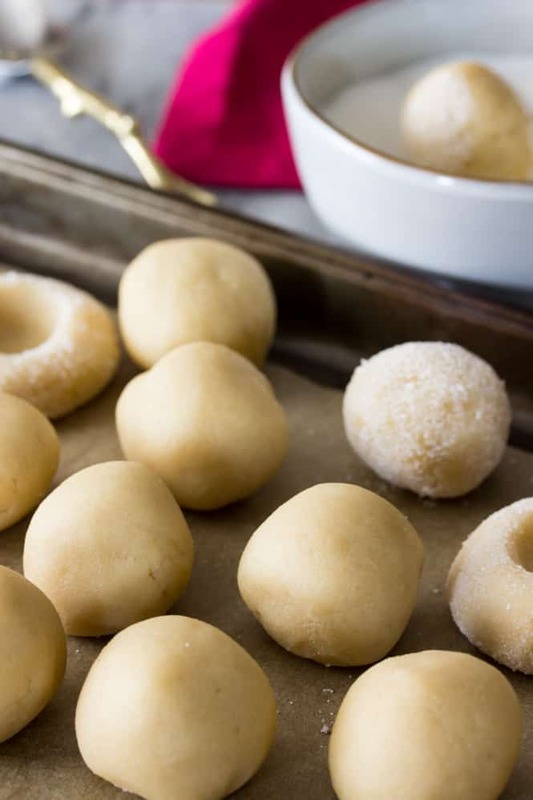 These thumbprint cookies are easy to make and the taste is incredible — they have soft, sweet interiors, sugared exteriors (though you can leave off the sugar if you’d like) and jam filled centers. 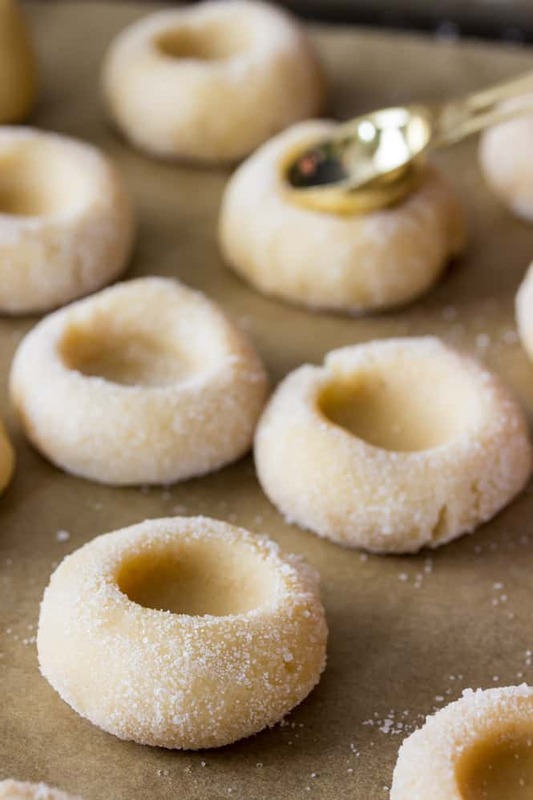 Let’s get started on how to make the perfect thumbprint cookies. For perfectly soft cookies that don’t spread: Whenever possible, I recommend using a scale to measure out your ingredients. 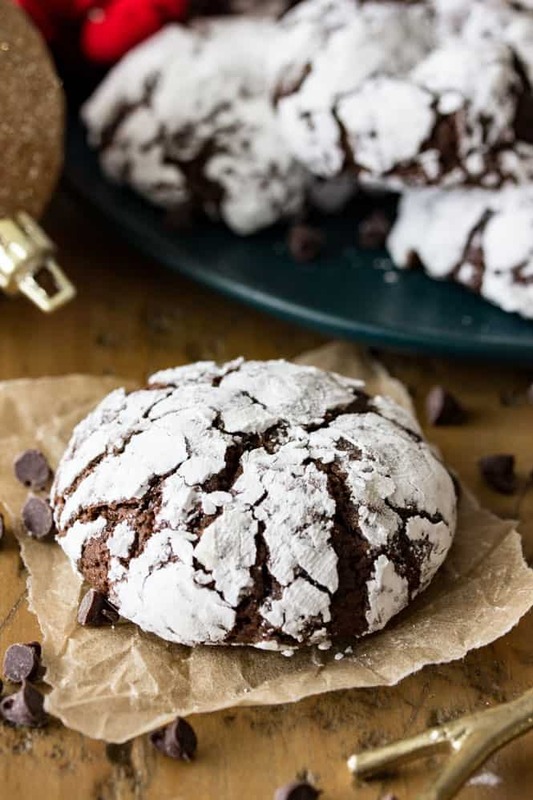 It is so, so easy to over-measure or under-measure flour when using cups, causing your cookies to be too hard or to spread when they shouldn’t. 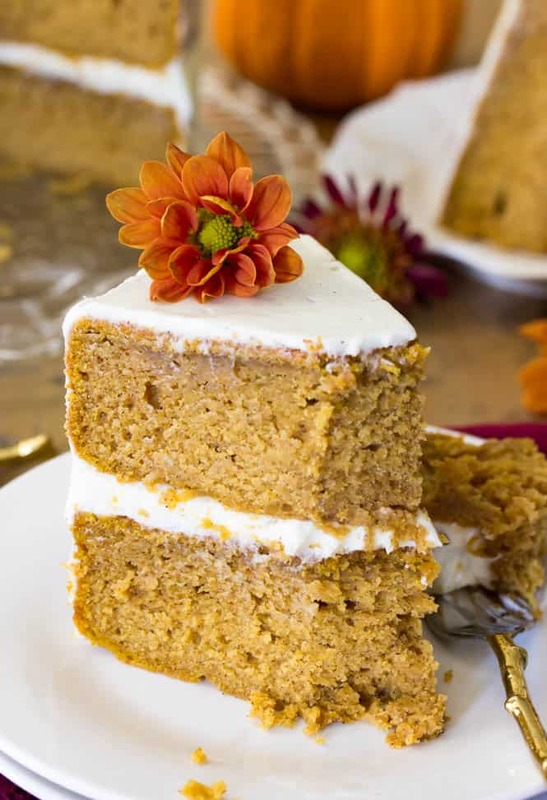 If you don’t have a scale already, here is the one that I use in my own kitchen (affiliate link), it’s inexpensive and accurate and I can’t even bake without it anymore. For thumbprints that don’t crack: This dough is firm enough that you should be able to roll it into balls right after mixing it together (no chilling). Roll the balls between your hands until they are really, really smooth and there are no lines or cracks in the dough. Roll the cookie dough in sugar (optional) and then gently use your thumb or a teaspoon to slowly press an indent into the cookie. If you see the dough starting to crack anyway, you can usually press the dough back together successfully! 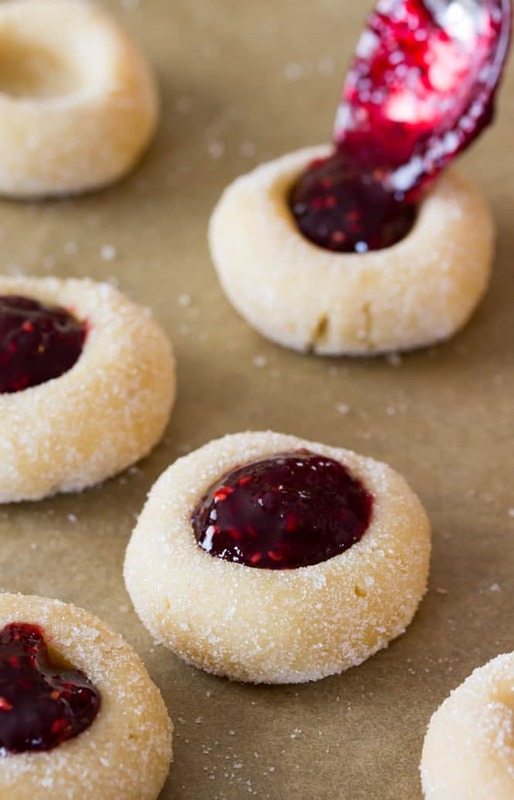 Thumbprint Cookie Filling: I know that not all recipes do this, but I recommend adding the jam/preserves (you can use either) before baking the cookies. If the jam is too firm and isn’t easy to drop into the cookies, then place it in a microwave-safe bowl and heat it in the microwave for just a few seconds, just until it is easy to stir (you don’t want the jam to be hot, just more fluid and cooperative). Another tip to prevent spreading: This is a good rule of thumb for just about every cookie recipe. Never place your cookies on a hot cookie sheet. Make sure your cookie sheet has cooled completely before placing your next batch of cookies, otherwise they’ll start melting before they can start baking, and they’re much more likely to spread. 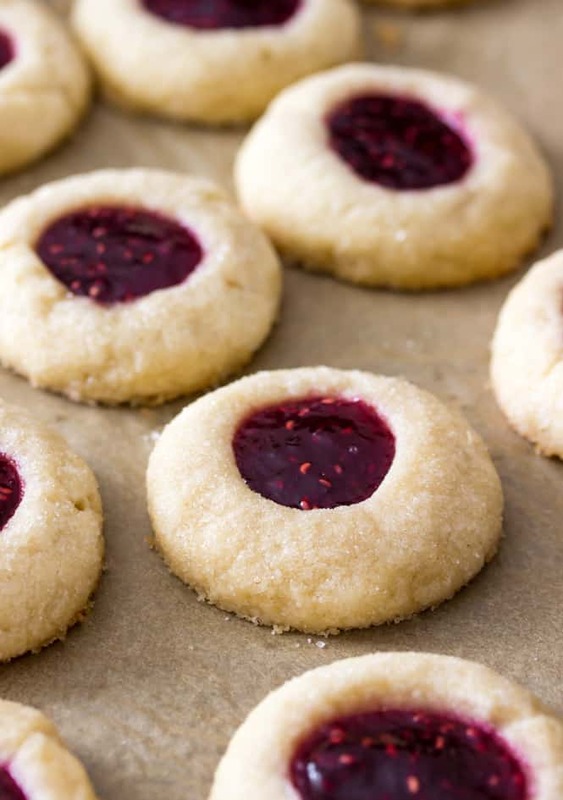 I used raspberry preserves in this recipe and really loved the way that the slightly tart raspberry flavor melded with the sweet sugar cookie bases. You can use any variety of jam or preserves that you prefer, though, I know that apricot and strawberry are popular options. You can also definitely opt for a seedless option, I liked the texture of the raspberry seeds (something my 12 year old self would be in utter shock to hear), but know that not everyone does! 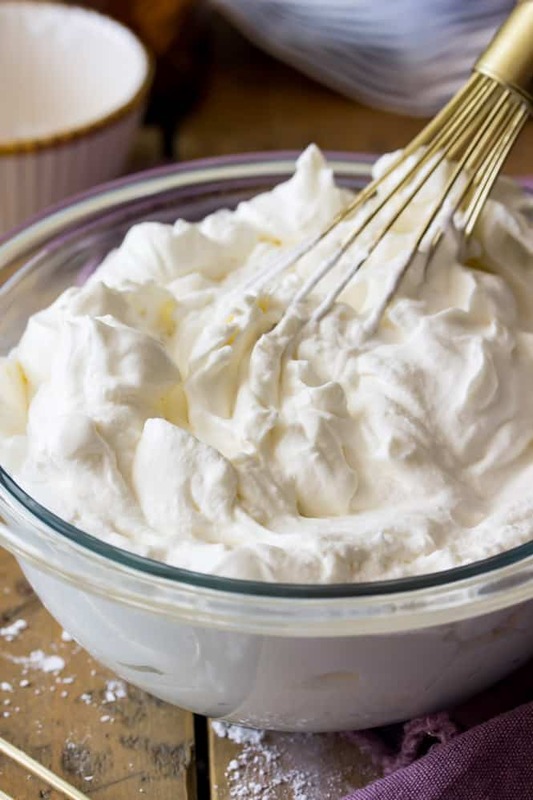 As I mentioned above, I really recommend adding the jam before baking the cookies, but if you forget you can add it afterwards (you’ll need to re-indent the cookies immediately after they come out of the oven with a rounded teaspoon if you wait). As the cookies cool the jam will settle and firm up, and while it’ll remain slightly tacky even when cooled, they’re still firm enough that I stacked these thumbprint cookies on a platter to serve them over the weekend. 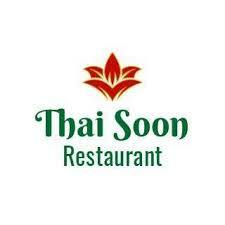 Enjoy, and I’d love to know what your favorite filling is! If you like thumbprint cookies, make sure to check out my bourbon-infused chocolate version, my peanut butter and chocolate version, and my key-lime version!